The predisposition for most of our families in the past was to stay put. The Poor Laws were intially disincentive enough to leave their home parish. But some saw opportunities or perhaps salvation in pastures new, and left Devon usually in search of work. On this page we look at some of those whose moved elsewhere in the United Kingdom only, staying near enough to home. After militia man John Heard's move to Sandford from North Devon, the Heard family by and large stayed put around Sandford. The first generation of our Heards to spread their wings were his great grandchildren's generation. By 1871 John Heard, b.1852 in Sandford, had moved to Normanby in Yorkshire, with friends from Sandford and Morchard Bishop, and all were working as ironstone miners. The opportunities there must have looked promising, for in 1873 John's cousin Mary Heard married agricultural labourer William Dadd, and in about 1875 William and Mary followed John north to Guisborough where William too began work as an ironstone miner. William's brothers George and John Dadd seem to have moved to Guisborough about the same time. 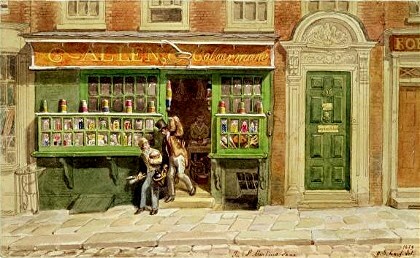 The Dadds settled in Yorkshire, where William and Mary started a green grocer business. But after the 1871 census John Heard disappeared. Did he go to the goldfields of Australia? I'd love to hear from anybody who knows. 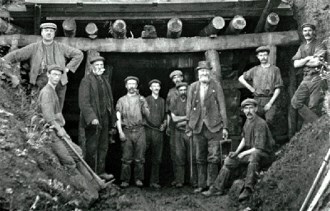 The census returns suggest that there may have been a recruiting drive in mid-Devon for miners, as there were several Devonshire-born miners working in the northern ironstone mines. Fey in-laws the Robins family also went to Guisborough to mine in the 1870s. The family had other connections with the area, for Yorkshire-born Great Great Aunt Jane Coulson moved to Sandford as a lady's maid in the household of the Ferguson Davies, and married Great Great Uncle James Wright. They moved back to Yorkshire where she died suddenly and was buried in Guisborough cemetery in 1900. 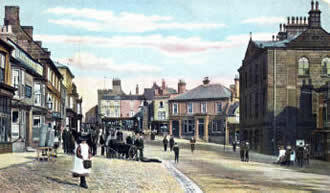 James returned to Sandford and married again in 1903. Daniel Heard, b. 1849 in Sandford, another great grandson of that North Devon John Heard, was working as a carter on a farm at the age of 12, but clearly felt this was not the career for him, and in 1871 was in service as a footman for banker Frederick Milford at Matford House, St Leonard's, Exeter. 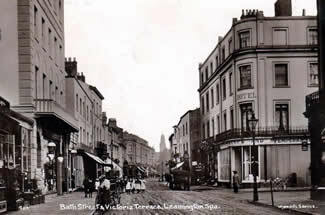 Married in 1873, after a brief spell in Brixham, Daniel and his young family moved to the Midlands, to Leamington. Daniel was now a butler. The family settled in the town, and by 1901 Daniel was working as a waiter "on own account". There is something of a mystery about Daniel's career for he was living apart from the family in one census return, and continued to record his career as butler or waiter. But in Kellys Directories and in references to him in newspapers in the 1890s he was a greengrocer. Daniel's eight children stayed in the Midlands, in Warwickshire and Staffordshire, thus establishing a branch of the family there. Two generations later some of Daniel's descendants were to emigrate to Canada, establishing Heards in Alberta, and their in-laws to Australia, carrying the Cornish name Treliving to Victoria. The migration of our family members is mapped here. Frank Heard, born in Linscombe, Sandford, in 1857, Daniel's brother, also decided to move away from Devon. After his marriage to a cousin Mary Ann Heard he worked as a railway porter, and then a shunter, living in Exeter. But his wife died in 1888. At about the time of her death he was disciplined for neglect of his duty and abusive language, and in April 1889 he was dismissed. He seems to have moved to London then. In 1891 he was living in East Ham with his children. He stayed in the East End, and certainly worked for a while in or near the docks. He never returned to Devon. Poor Frank appears to have ended up in the common lodging houses of London. He died in Poplar, in 1928. William's second cousin, Walter John Heard, born Sandford, 1887, married Sarah Lynes, in 1913, a Warwickshire girl in service, who had probably moved to Exeter following work. Work also seems to have taken the newly-weds to Barry, South Wales, where their first children were born. They returned to Devon, but the marriage did not work out. Sarah went back to her family home in Warwickshire. More Heard children were born. Sarah then settled in Wales with the youngest children. Consequently whilst some of Walter's children remained in Devon, Heard family branches were also established in Warwickshire and Wales, and are there still. Another second cousin of John, William and Charley, Reuben Heard born in Exeter in 1886 was apprenticed to an Exeter bookbinder in 1903, and completed his apprenticeship in 1907. By 1911 he had found himself work as a bookbinder in Workington, living in John Street where his employers, the printers Middletons, were also located. This was a considerable distance to travel. Perhaps he saw the position advertised in the trade press. He met his wife-to-be Esther Wilson at chapel in Workington. When war broke out he enlisted in the 3rd Devonshires. He was wounded in 1918. Whilst he was in England recovering from his wound he married Esther, in March 1918. She was 36. By 1920 the couple had moved back to Devon, to Stonehouse, Plymouth. In 1930 after Reuben had been out of work for some time he got a job through a friend with the Oxford University Press. He worked in Oxford until retiring , back to Devon again! This time to Exmouth. Several of the great-great grandchildren of militiaman John Heard were willing to leave Devon and find work further afield. In the early years of the 20th Century before 1908, Great Uncle William Heard, b.1885, who had served his apprenticeship as a wheelwright in Newton St Cyres, moved to Southall, Middlesex, where he married local girl Lucy Groves. He worked as a joiner there. William and Lucy's nine children established a branch of the Heard family in Middlesex. William's older brother Great Uncle John Heard b.1872, a shoemaker like his father, lived in East Street, Crediton with his parents until his marriage in 1898 when he moved to London, working at his trade in Kensal Rise with his wife Emma Wood. 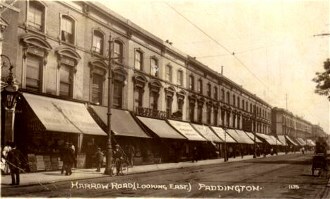 In 1911 the family were in Paddington. But some time after 1915, perhaps about 1920, they moved to Warminster, where John stayed for the rest of his life, with a boot and shoe repair business in West Street. His daughter died there in 1925. His son Bertie married a girl from Cumbria, and worked in a Warminster garage. Bertie had two children. 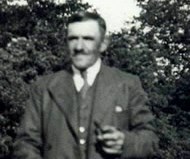 A third brother who moved away from Devon was Great Uncle Charley Heard. By 1901 Charley, like his brothers John and William, had gone to work in London, as a general building labourer. At first he lived in Marylebone. Then by 1911 he was living with a partner that he claimed as his wife, Florence Cann from Sandford. It seems likely that he knew Florence before he moved to London. Did she move there to join him? By 1911 they had a young son in Paddington, but they didn't marry until 1915. It is likely that Charley and his brother John, who both lived in Paddington for a time, would have got together on occasions. By the late 1930s Charley and Florence had moved to Hampshire, and lived in Over Wallop. Charley was a scaffolder. Certainly his brother William from Middlesex maintained contact with him. Thus three of William and Ellen Heard's five sons left Devon to follow their careers. The remaining two sons, one of whom was my grandfather, stayed in Crediton all their lives. John, William and Charley did all return in 1925 for their father's funeral. Carpenter James Fey, born in Shobrooke in 1821, must have been one of the first of the family to take advantage of the railways. He married Elizabeth Coles of Newton St Cyres and moved to St Michaels, Bristol in about 1851. Some time during the 1860s his nephew, builder Edwin Fey followed, with his wife Sarah Hector. And around the same time another nephew, builder James Fey, born in Cheriton Fitzpaine in 1842, also moved there. More Feys followed, and the Feys became well established as a Bristol family, such that by 1881 their concentration there was second only to that in mid-and south-Devon. By 1998 the Bristol and South London frequency of the Fey surname had overtaken its source in mid-Devon. John Fey, another carpenter born in Shobrooke, in 1833, seems to have been the first to settle in Southwark, having moved there in the early 1860s. His younger brothers Matthew and Luke Fey followed him, and they were joined there by subsequent generations. For some time Feys were living in Webber Row, just a stone's throw from Waterloo Station, according to Booth's survey of London a mixed area, housing those of chronic poverty through to those in comfortable circumstances. Thomas Fey b.1832, who originated around Bow and Spreyton, seems to have learned his trade in Exeter, then moved to London, settling for a while in South East London, his first wife coming from Bermondsey. Thomas moved to Chelmsford, where he married his second wife, and his descendants are there still. Thomas was a skilled leather craftsmen, and the skills were passed from generation to generation. At least one of his grandchildren moved back to South-East London, and there were several generations of Fey descendants living in Bermondsey in the 20th century. The son of great uncle Walter William Henry Turner told the story of how his father and his uncle Ernest John Turner - both living in Crediton - had gone to Wales for a weekend. They went to the station to get the train home on the Sunday, only to discover there was no Sunday service. They feared they would lose their jobs when they did not turn up for work on the Monday morning. 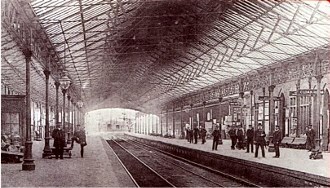 Discussing their predicament on Cardiff station, they were overheard by the ticket collector, who came from Sandford. He got them jobs with the GWR in Wales, and found them lodgings with another Devonshire ex-patriot - a lady from Newton St Cyres. So the brothers took these new jobs, stayed in Wales, settled down, got married and brought up families there. Unfortunately it has not been possible to establish the facts of it. 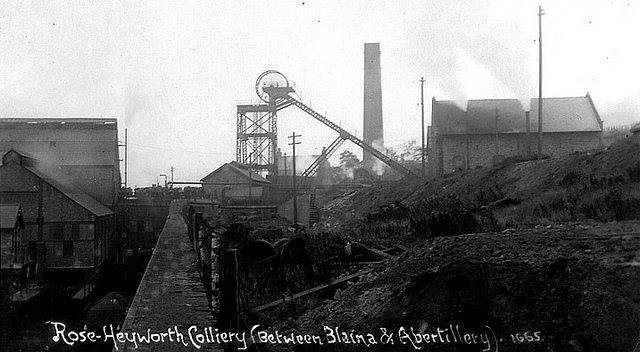 Both brothers were employed by the GWR in Wales, but elder brother George was employed in the small town of Blaina, in Monmouthshire, from August 1913, as a porter, and the employment records of the GWR suggest that brother Ernest was not employed as a porter at Cardiff station until May 1919. But the brothers did both settle in Wales. There are Turner descendants there still. 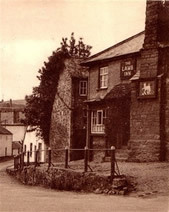 Great great great grandfather William Milton and his brothers were licensees of three pubs in Crediton in the first half of the 19th century. Within three generations or so, almost his entire line had died out or moved out of the parish - mostly out of the county, with the exception of my maternal great grandmother. Several of William's children left Devon for London - early migrants. The first of William Milton's descendants to leave Devon was his daughter Mary Ann Crossman Milton. She moved to Bloomsbury, London with her first husband, builder, Richard Trobridge between 1835 and 1838, before the railways had made journeys from Exeter to London relatively easy. After Richard's premature death in 1838 she married master baker John Hooke, and lived with him in at 38 Upper Barnsbury Street, Islington until her death in 1875, just five months before her husband's. John and Mary Ann appear to have prospered, but there were very mixed fortunes for their children. Son John Henry Hooke started out as a baker like his father, but by the time he was 40 he was a general labourer, ending his days as a fish porter when he was 60. His half-sister Mary Ann Trobridge fared rather differently. She married livery stable keeper Thomas Holder. Thomas may have kept fly carriages for hire quite early on in his career. 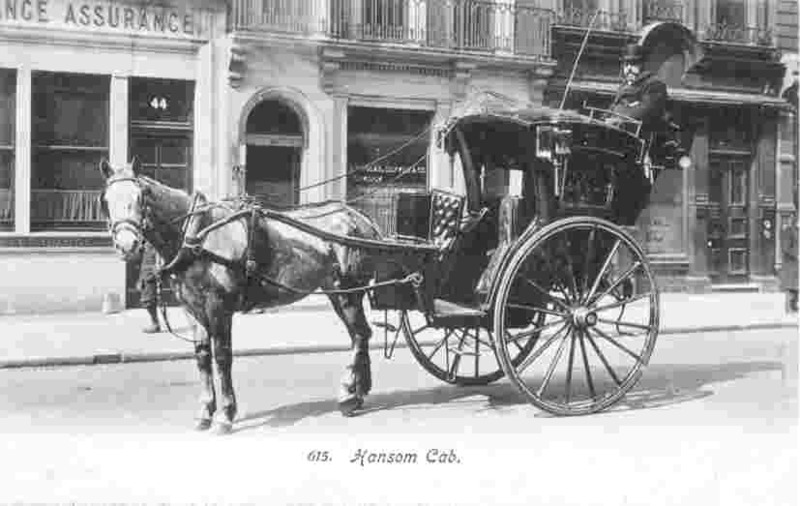 By 1875 the family had moved from Islington to Westminster, and he was a hackney cab proprietor. Mary Ann and Thomas appear to have lived very comfortably in Westminster. 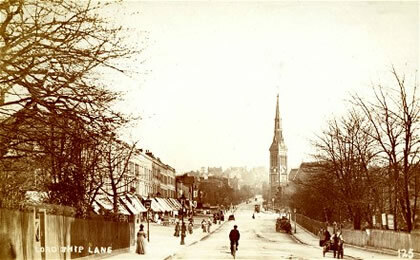 She died in 1902 ,so Thomas moved in with his daughter in Balham. When he died in 1905 he left an estate valued at the enormous sum of £32,376. William's son John Crossman Milton was keeping the Seven Stars Inn in Crediton when he married Caroline Gover. She died in 1851 and he married Louisa Russell in Exeter. Shortly after their marriage they moved to London, and settled in Lambeth. By 1862 he was working as a cordwainer, which in all probability he had trained for as a child. In 1871 he was working as a lodging house keeper. In 1881 he was a decorator, and 1891 a painter. It is difficult to escape the conclusion that John had not done well in London. Their daughter Ellen Milton married George Vestey. They lived in East London, at Bethnal Green and Hackney. George was described variously as a law accountant, an accontant and a solicitor. Ellen's sister Elizabeth Milton married cousin William Gover. They lived in Lambeth, as her parents had done, where William was a painter and decorator. William Milton's youngest daughter Catherine Milton married builder George Jefferis in 1846, and not long after the marriage also moved to London,where they lived in Westminster for a while. But they soon moved to the south coast and settled in Portsea. 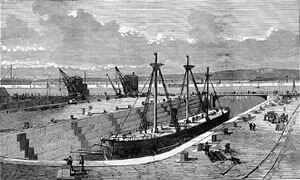 George did well at his trade, for he was appointed to the job of Foreman of Works for the Portsea Dockyard extension. When he died in 1887 he was described as "the much respected foreman of HM Dockyard, Portsmouth". After his death Catherine returned to Devon, the only child of William Milton to do so, and ended her days as a boarder in the house of her niece and nephew Lewis and Mary Wright, my great grandparents, where she was known as Aunt Jefferis. She left an estate valued at £1238 - a good sum for 1913. In the 1860s John Labbett had moved from Crediton to Stoke Damerel where he married Crediton girl Maria Fey. John was a policeman at the Dockyard. Perhaps surprisingly at that time Naval Dockyards came under the jurisdiction of the Metropolitan Police. This may have prompted John to join the London force, for he took the family to London, and settled in Paddington, joining the London force on 17 June 1872, his warrant number 55524. 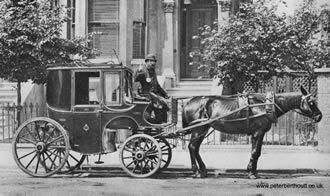 Throughout his time in London John and the family lived at various addresses in Paddington.He retired from the police on 21 August 1891. He seems to have served his time in D Division, Marylebone, in the neighbourhood of his Paddington homes. He never rose above the rank of PC. 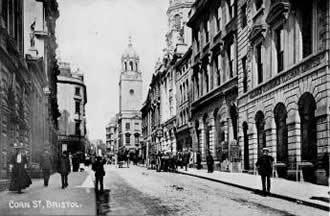 In the 1870s John's brother William Labbett left Crediton, and also moved to Paddington. He married cook Mary Jane Mounsdon, a Crediton girl who had moved to London in the 1860s. William worked as a farrier and blacksmith in the Kensal Rise /Paddington area. Unfortunately we cannot know if he moved there to be with Mary Jane, or on the recommendation of his brother John. Another of our families that moved to the South-East and established branches are the Picketts.Picketts lived in Sandford for at least seven generations. 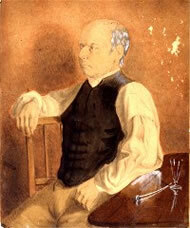 William Pickett, born about 1760 probably, was the patriarch of the Sandford Picketts, publican of the Lamb Inn. His descendants were publicans, shopkeepers and tailors. His grandchildren's generation included the first Picketts to migrate from Devon, rather earlier than some of our other families. His grandson James Pickett, born 1821, was apprenticed to the Bicknells, in Crediton who were tailors. He left Devon for London in the early 1840s, and there married Eliza Bull. He found work as a tailor, and in 1851 was lodging with his wife and three children in Finsbury. 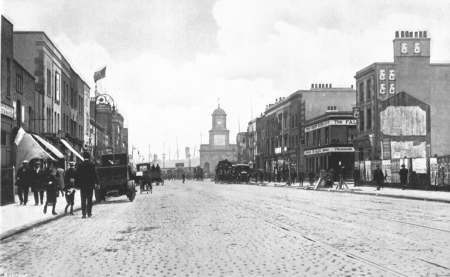 James prospered at his trade, for by 1861 he and the family had moved to Grafton Street, where he was a master tailor employing two men and a boy. His son William Pickett joined him in the business, and by 1871 the family were taking in boarders and lodgers. In 1881 both sons William and Richard Pickett were working with their father in Grafton Street, and perhaps too his daughter Julia Pickett was working as a saleswoman with them at Grafton Street.From the Business Directory of the time he may have had a shop in Tottenham Court Road too. James died at Grafton Street in 1883, leaving a personal estate valued at over £4250. Brother Richard Pickett was apprenticed to his uncle John to learn tailoring. 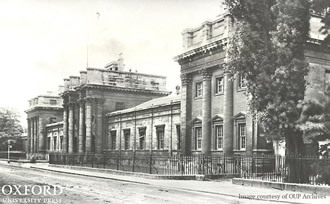 On completing his apprenticeship around 1850 he moved to London, and at first was in the same lodgings as his brother James and family, in Finsbury. In 1855 he married Elizabeth Blackie, the daughter of a tobacconist. They went to live at Frederick Place, St Pancras, and widowed father-in-law William Blackie lived with them. By 1871 it appears that Richard had taken over his father-in-law's business of tobacconist, and the father-in-law, in his 80s, was still living with Richard, his wife and son now in Hampstead Road. 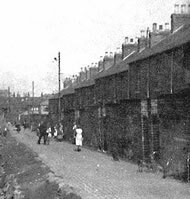 Julia, brother James's daughter,was also living with them and working as a shop assistant in the business. Ten years later Richard had retired from tailoring and his son William was a tailor's clerk. They were by then living at Hungerford Road, Islington. 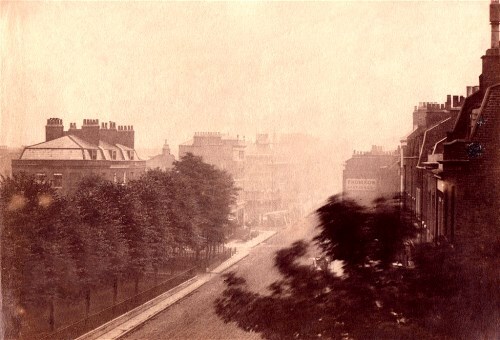 Richard's wife died in 1884, he stayed at Hungerford Road with son William, who became a master tailor, and some time after his wife's death, his sister Mary moved in. 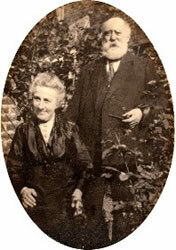 She died in 1895, and Richard died on 19 March 1901. His estate was valued at £6,914 17s 9d. Thomas Pickett, b.1824, brother of James and Richard followed a different trade, and worked as a carpenter and joiner. He was apprenticed to a builder in Witheridge. 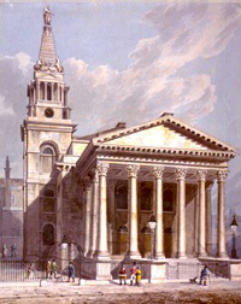 By 1851 he had moved to London and was a carpenter journeyman. He married Catherine Watkins and 1851, and for the next fifty years worked variously as a carpenter and joiner, or a carpenter foreman. Th couple's only child William Francis Pickett b. 1854, became a carpenter and joiner and worked with his father. Catherine died in 1883, and after her death her niece Jane Cook kept house for her uncle and her cousin in their home at Holford Square. Thomas lost his son William in 1902, and he died himself in 1908 at 9 Clarendon Road, Tottenham. 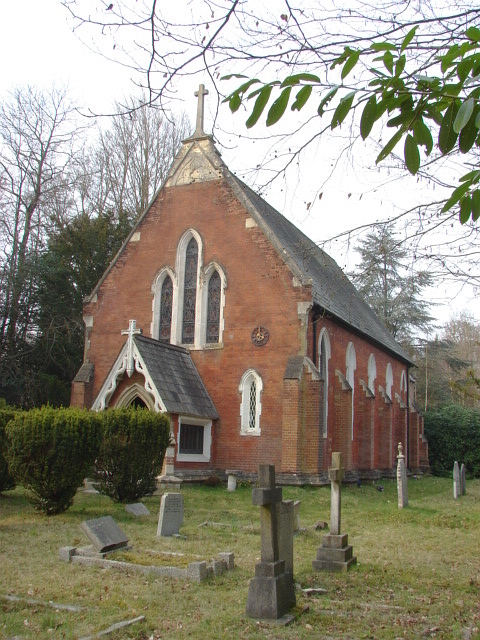 Both Thomas and his son were buried in Tottenham Parish Chapel, and it may be that they had workhouse funerals. Mary Pickett, sister of Richard, James and Thomas was born in 1828, went into domestic service, and found a career as a cook. Her jobs took her to work around England and Wales. 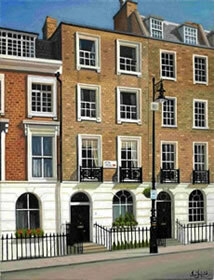 It is possible that she was cook for Lord Russell, at Chester Square, Belgravia, London, in 1854. In 1861 and 1871 she was cooking for lawyers, in Weybridge, Surrey, then in Marylebone. 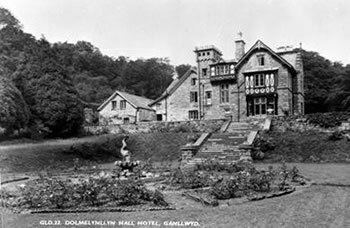 In 1881 she was cook at Dolmelynllyn House, an ancient Welsh manor in Snowdonia. In 1891 she had retired from cooking and was with her brother Richard at Hungerford Road, Islington, where she and her brother were both described as living on their own means. She had prospered at her job. She died in 1895 in Islington, leaving an estate of £256. 9s 6d. Another of William Pickett's grandchildren, John Pickett was a tailor, shopkeeper, and kept Sandford's Post Office. He had eight children between 1843 and 1856. Though he stayed in Devon, four of these left the county, including Harry who eventually went to Australia. Elizabeth Greenslade Pickett had been a dressmaker, and then a lady's maid. It was perhaps that job that took her to London some time in the 1870s. She married Stephen Wilkinson in 1878. In his youth Stephen had been a page, and at the time of their marriage he was a butler. Did they meet in domestic service? Both gave it up, and when their first child was born Stephen was the licensee of a beer house at 10 Friar's Road, Southwark. He did not stick at this occupation, perhaps abandoning it after the infant death of that first child. 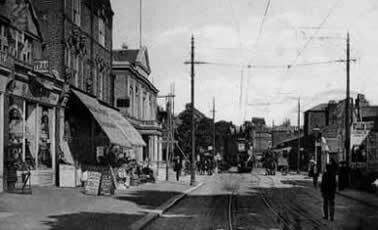 In about 1880 they moved to East Dulwich, to Upland Road, and there Stephen started the business of oilman that he worked at for the next 30 plus years. ( Manufactured and dealt in paint and pigments, responsible for mixing the required colouring. He could have been a seller of oil for heating or cooking, or a seller of victuals, but the census enumerator has scribbled "colour" next to oilman on the returns for 1881-1911, probably to distinguish him from those other types of oilman. ) Elizabeth and Stephen lived the remainder of their life together in East Dulwich's Upland Road, where he carried on the business. We know that they kept in touch with the family in Sandford, as Stephen was a witness for his sister-in-law's wedding to James Wright in Sandford in 1903. 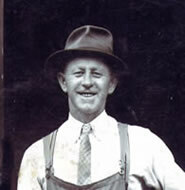 Walter Pickett, John Pickett's eldest son, learned his trade as a baker from his uncle in Exeter. He married Elizabeth Haysom in 1868, in Warwickshire, though she was born in Lambeth. By 1871 he and Elizabeth were living in St Pancras, London, where he was working as a baker. By 1875 the family had moved to Hampstead, where Walter was described as a baker and confectioner. Their children were born in North London, in Camden Town and Hampstead. It appears that some time in the 1880s the marriage broke down. 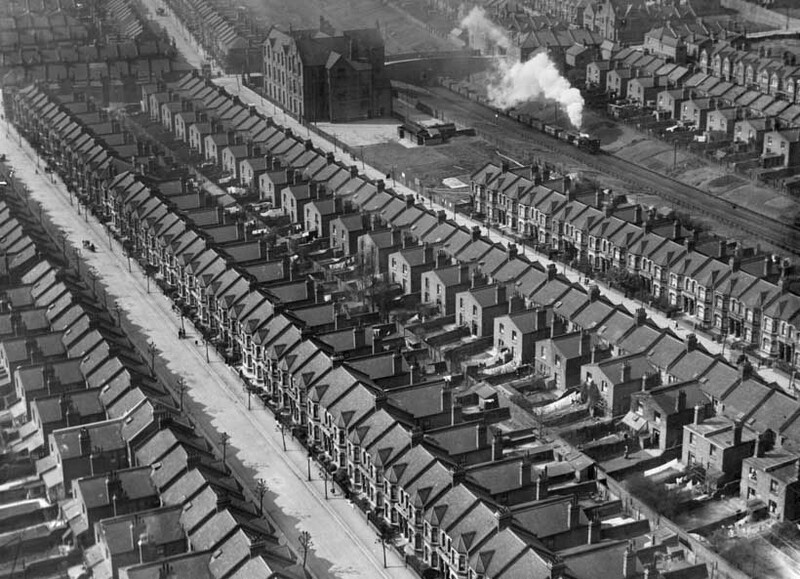 By 1891 Walter was living in Orville Road, Battersea, perhaps working in one of the nearby commercial bakeries, whilst Elizabeth was living in Mantua Street Battersea, with the children. They are not to be found in 1901, but in 1911 Elizabeth may have been living as a boarder in Mortlake. 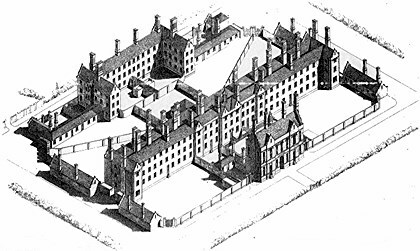 Walter was in the Greenwich Union Workhouse. His life must have been a struggle by then. He remained in East and South East London, dying in the Greenwich Workhouse in 1930, having been taken there from his home in Deptford. Elizabeth was living in Balham in 1919, her son Percy living with her. She died in Richmond, in 1937. Before they split up the couple had four daughters and three sons, two of whom were bakers like their father. Harry Pickett was working in the family shop when in the 1860s he moved to Maidstone, Kent to work in the business of woollen draper Joseph Butcher, a long-established firm. Perhaps his father's business contacts enabled Harry to find a place where he could learn the business. 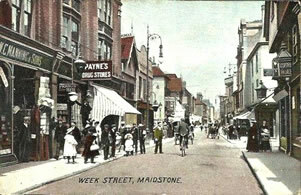 He lived with his boss's family at the workplace in Week Street, Maidstone. This was close to the pub run by his mother-in-law to be. The story of Harry's marriage is here. Seven years after his marriage, he departed England for Australia. 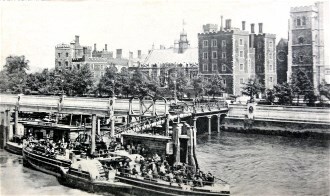 The last of John's sons to leave for London was John Pickett junior. Like his brother Harry he pursued a trade in the woollen business. By the time he was 18 he was working as an assistant for woollen draper Thomas Lamb, in the heart of London at 78 St Martins Lane. It must have been very different from Sandford for the young man. He moved south of the river,and married Ellen Sarah Smee in Southwark in 1877 . By 1881 John, Ellen and their children were living in Brixton, where he was working as a warehouseman. 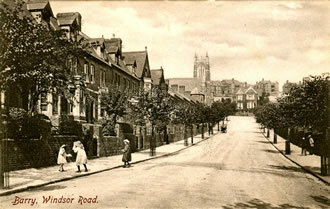 By 1883 the family had moved to Wakehurst Road, Battersea. John was working as a woollen warehouseman. 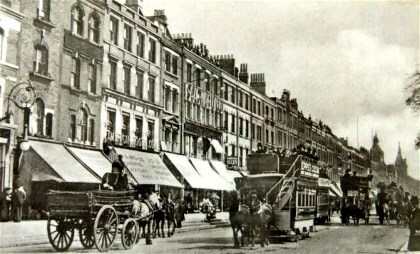 The family settled in Honeywell Road Battersea. How much contact did they have with brother Walter and sister-in-law Elizabeth? Sons Arthur Pickett and Ernest Pickett joined their father as woollen warehousemen. By 1911 John was describing himself as an agent in various products, whilst Arthur and Ernest continued at their work in the woollen warehouse. John and Ellen had lost three of their nine children by 1911 and were to lose son Arthur the next year, and son John in 1915 in Flanders. William Pickett (1821-1873), like his brother John was a tailor and kept a grocer shop in Sandford. He had seven children who survived to adulthood - all daughters. Three of these were to leave Devon. The first was Lucy Pickett. Lucy was a nurse. Tragically she died a week after her 21st birthday in University College Hospital, London, of typhoid fever and pneumonia, perhaps contracted from a patient, in February 1869. Daughter Ellen Pickett went into domestic service for a doctor in Sandford, where she was working as a housemaid in 1871. During the 1870s she had moved to London, fallen pregnant with her daughter Amelia Vincent Pickett, who was born in Chelsea in 1879, and found a position as housemaid with the Hon. Spencer Lyttelton,marshal of the ceremonies to the royal household, second son of 3rd Baron Lyttelton, at his house in Eaton Terrace. Whilst she was working there in 1881, her daughter was being looked after by a foster mother at 14 Grosvenor Cottages, Knightsbridge, in a lodging next to that of her husband-to-be Henry Mountjoy Jones. In the next house was her sister Amelia Pickett, then an out of work servant. It is possible that Jones was the father of Ellen's daughter, but as she had a second name of Vincent, that seems unlikely. Ellen and Henry Jones were married in 1883, and they settled at Lumley Buildings, in Pimlico. Henry worked successfully as a tin plate worker. They had another four children. Sister Amelia had also gone into service in Crediton. And like her sister she too fell pregnant,but at the age of 16. Perhaps she was sent off to her sister in London, to get her away from Sandford gossips, for the child Adeline Lucy Pickett was born in Chelsea in 1874. In the baptism register the child is described as illegitimate, the parents Louis Duval and Amelia Pickett. The father's name has then been crossed out. 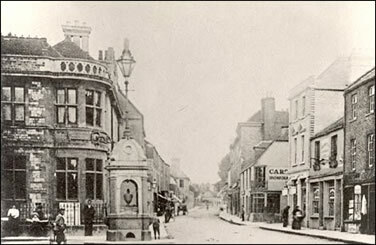 Adeline was sent back to Sandford, where she was brought up by her grandmother, and settled in Crediton. By 1891 we find her mother working as a cook in the Vicarage of Long Cross, Chertsey, Surrey. In 1911 she was the Matron in charge of housework at the Home of Mercy, North Hill, Highgate, London. This was originally the London Diocesan Penitentiary for reformation of fallen women. By that time the House was run by Clewer Sisters - the Sisters of Mercy, an Anglican religious order of Augustinian nuns. Was it ironic that Amelia worked there? The Picketts' moves to the Southeast brought mixed fortunes for them, and not a little tragedy. But they must have been like millions of others that saw the country opened up and took advantage of it. And their families are there still to remind us of their ancestors' pluck. Many thanks to Pat Pickett for her help on this page.